Georgia State’s losing streak moved to five games as they began a two-game road trip. Louisiana (5-5, 3-3) and its two 100-yard rushers led the Rajin’ Cajuns to a 36-22 win over Georgia State (2-8, 1-5). Aaron Winchester started at quarterback for the first time since opening day in 2017. Dan Ellington did not enter the game due to an injury he suffered last week against Texas State. Both Sun Belt teams entered the game on the heels of a loss. Georgia State was dominated by Texas State’s passing attack in the third quarter of the previous game. This week, Louisiana scored three rushing touchdowns in the fourth quarter and gave up a 92-yard rushing touchdown in the first quarter. Elijah Mitchell ran for 136 yards on 19 carries and he wasn’t the Louisiana back with the most yards on the day. Raymond Calais finished with 186 rushing yards and three rushing touchdowns including the 92-yard score. The Rajin’ Cajuns out-rushed the Panthers 355-252 with an average of 9.2 yards to rush. Winchester, Ellington’s backup prior to the injury, passed 10-of-21 for 121 yards and threw both one touchdown and one interception. The interception was the first thrown by a Georgia State signal-caller in more than five games and 181 pass attempts. Ellington hasn’t thrown under 50 percent all season. Even though the loss only worsens their already sub-500 record, the Panthers’ rushing attack has some consistency. Georgia State had 252 rushing yards and two rushers with 75 or more yards and another with more than 50. Tra Barnett and his 82 yards made him the leading rusher in the running back corps for the fourth straight week. Demarcus Kirk’s explosive performance was a pleasant surprise for the Panthers. Kirk’s nine carries, 79 yards and 8.8 yards per carry are all season highs. The game begin with a Louisiana drive into Georgia State territory, but it eventually punted. The teams would then, collectively, have five consecutive three-and-outs. Louisiana ended that streak on the very next play. Raymond left every Panther behind, and ran 92 yards to set a new Louisiana record for the longest rushing touchdown in school history with 4:31 left in the opening quarter. Georgia State put together a solid drive of 61 yards to follow, but Brandon Wright missed a 29-yard field goal after the Panthers made it the Louisiana 12-yard line. On the next possession, Louisiana quarterback Andre Nunez found Ryheem Malone for a 32-yard touchdown, and Louisiana took a 13-0 lead early in the second quarter. Nunez finished passing 14-of-19 for 141 yards and one touchdown. Georgia State gained only 86 yards of offense until its final drive of the first half. Luckily, they scored on it. Winchester wasn’t having a good day passing, but he found a stride here, and threw a 45-yard pass to Cornelius McCoy for the first explosive play of the game. He then connected with Devin Gentry for a13-yard touchdown pass with 0:14 remaining in the first half. The score was 13-7 at halftime and Georgia State was within striking distance after displaying an overwhelmingly underwhelming showing so far. The Ellington-less Panthers were in position to take the lead to begin the third quarter. The offense was flowing, picking up two first downs and 35 yards in its first three plays of the quarter. It came to a halt, and they faced third-and-11 after two unsuccessful plays. Tucker Gregg, freshman running back that hadn’t logged a carry this season, ran eight yards to give Georgia State a 4th-and-3 at the Louisiana 29. The Panthers attempted their third straight fourth down. They were unsuccessful this time and squandered their opportunity. Winchester took the shotgun snap and had a chance to hit Hart early, but he held on and ate a 7-yard loss by running out-of-bounds. Trailing 13-7 with 12:03 remaining in the third quarter, the Panthers tried to keep Louisiana from increasing its lead because they were still in the game. Louisiana brought a solid red zone offense into the game. It almost scored a touchdown after putting together a nice job including two third down conversions. Kyle Pfau made a 21-yard field goal to put the Rajin’ Cajuns up 16-7 with 7:18 left in the third quarter. The 11-play, 60-yard drive chewed nearly five minutes off the clock. Georgia State answered right away. In just 1:46 of game time, the Panthers scored a touchdown cut Louisiana’s led to 16-14. The young offensive line’s blocking was pivotal on this drive. They cleared holes big enough for Kirk to run through, and Kirk’s power added more yards to already big runs. Kirk converted the drive’s initial first down with a 13-yard rush up the middle. On the next play he ran over a Louisiana defender during the 17-yard gain. The run energized the entire sideline including the coaches. Kirk, a redshirt senior, hasn’t played much offense this year. His game high prior to the game was 14 yards, fewer than the 17-yard play. Georgia State faced a fourth-and-1 shortly after and converted it with a quarterback sneak by Winchester. Kirk fittingly scored the drive’s touchdown with a 21-yard rush. The two-point lead after Kirk’s score was as close as Georgia State came to taking a lead. Georgia State’s defense allowed Louisiana to put together a 7-play, 76-yard touchdown scoring drive in less than three minutes. Raymond ran in a 26-yard affair, his second rushing touchdown, and made the contest a two-score affair. Forty five of the drive’s yards came on the ground and 31 were through the air. The drive encapsulates the total defensive performance for a unit that gives up 496.9 yards per game. That total defense average is 124th out of 130 FBS teams. 250.8 and 246.1 of the yards are rushing and passing respectively. Louisiana scored 20 points within the next seven minutes on its next three drives, all of which lasted less than 2:30. All three scores were rushing touchdowns and one extra point attempt was failed. No teams in the Bottom 10 of total defense except 7-3 Houston have a winning record. Defense wins games, and the Panthers’ record shows that they’ve been well below average this season. Georgia State faces Appalachian State (7-2, 5-1) on Nov. 20 on the road in Boone, North Carolina. The Appalachian State Mountaineers 446.3 yards per game ranks 34th is total offense. Appalachian State averages 2.7 rushing touchdowns per game and Georgia State allows 2.6. 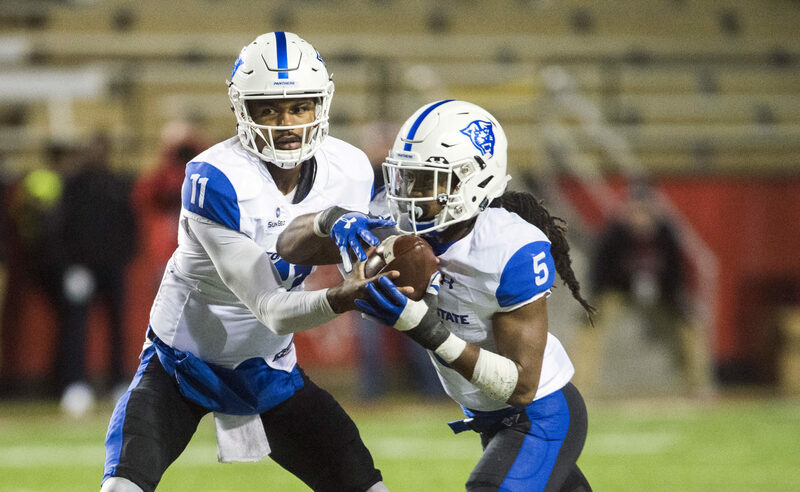 Potentially more alarming is that Georgia State has scored just 16 points against Appalachian State in four meetings. The Panthers are 0-4 all-time against the Mountaineers and lost 31-10 to them in 2017. The game begins 2:30 p.m. and will be broadcast on ESPN+.